Comparative Video 101: From John Stewart & John Phillips: "Oh, Miss Mary"
From John Stewart & John Phillips: "Oh, Miss Mary"
When John Phillips died at the age of 65 in 2001, the obituaries and memorials quite naturally focused on his position as the founder, lead writer, and vocal arranger for the mid-1960s folk-rock band The Mamas and The Papas - as well they should have, since Phillips' vocal scores for the group were masterful and mature, surpassed in both complexity and sheer beauty in the pop-rock era by probably only Brian Wilson's arrangements for The Beach Boys. Phillips took the four voices of the band and layered a dozen and more tracks on top of each other, creating a shimmering wall of sound even when the group was singing in unison and not Phillips' famous harmonies and vocal counterpoint. What most of the obits noted only in passing, however, was that Phillips began his career in professional music as a pop-folk musician with a band that he formed called The Journeymen. Active from 1961 to 1964, The Journeymen were highly regarded for both their adventurous song selection and arrangements and for the blend that they achieved, with Phillips bringing in his childhood friend and long-time singing partner Scott McKenzie - he of the sweet and highly trained tenor voice that we all heard a few years later performing a Phillips song titled "If You're Going To San Francisco" - and an excellent vocalist in Richard Weissman, who also happened to be (and remains being) one of the greatest banjo players in the history of the U.S. The group was piloted by Frank Werber, manager and to a degree creator of the Kingston Trio, which even in 1961 was clobbering most of its competition in the folk and pop worlds in terms of record sales and income. Werber helped The Journeymen to win a recording contract with Capitol Records, also the KT's label, and Werber may have been grooming Phillips' trio as a possible replacement for the Kingstons since the latter group's founding member and chief arranger Dave Guard had left that group in a huff, hurling the KT and Capitol into a state of uncertain anxiety. It was at Capitol that Phillips met John Stewart, chosen over Phillips as Dave Guard's replacement in the KT largely because Stewart was an excellent banjo player and Phillips was not - and the banjo was an absolutely essential element in the sound that had rocketed the Kingstons to the top of the charts in album sales for the three years prior. Phillips and Stewart seemed to bond almost instantly. Both were songwriters, both liked folk music, and both had senses of humor that could be described charitably as somewhat off-beat. Stewart may even have flirted with the idea of joining Phillips in The Journeymen as a full partner, whereas in the KT Stewart was merely a salaried employee. The friendship quite naturally led to the two collaborating in the writing of four songs: "Chilly Winds," "Don't Turn Around," "You Can Rattle My Cage," and "Oh, Miss Mary." The Kingston Trio recorded the first and last of these, The Journeymen the last three. All are well-crafted tunes of the kind that were derided by purists of the time as "fake folk" or "faux-folk," songs that were designed to sound at least vaguely traditional but which had no "authenticity" or folk provenance. Yet "Chilly Winds" and "Oh Miss Mary" have been near the top of the list of favorite songs among KT fans for decades, as are two other Phillips compositions, "Goin' Away For To Leave You" and "Oh Sail Away" (written with Weissman). There was very nearly one more. 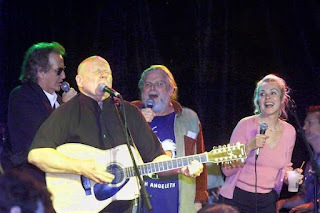 Stewart enjoyed recounting from the stage at the Trio Fantasy Camp in Arizona that Phillips, in professional limbo between The Journeymen and The Mamas and The Papas, had visited him in San Francisco in late 1964 and had played for him a recent composition that just knocked Stewart's socks off. Stewart wanted the KT to record it immediately, so he pushed Phillips into his own car and rocketed over to Columbus Tower, an office building owned by the Trio and home to their corporate headquarters. Phillips refused to leave the lobby of the building and go to Werber's penthouse office because "Frank doesn't like me very much." Stewart replied that that was nonsense and that Werber had an ear for good songs and that Phillips' new one was fantastic. So Stewart went up to Werber's office alone and told Frank that he had Phillips in the lobby and that the latter had with him a song that was a sure-fire hit. "Phillips?" screamed Werber. "In my building??? Get that drug-addled psychopath out of here right away! I'll call the cops on him!' "But the song, " pleaded Stewart. "We're never going to record anything by that loser again!" Werber fired back. The song that so excited Stewart was "California Dreaming." The female voices - original members Gayle Caldwell and Peggy Connelly, I believe - add a nice touch, and I do believe that I detect the distinctive sound of one of my friend Art Podell's arrangements. A final note might be in order. Now no one is more impatient than I am with folks who read too much into a song or poem, but in recent years I've noticed something interesting about "Oh Miss Mary." Its composition in 1961 or '62 came at a time when neither families nor society smiled benignly on girls who went off wandering on their own chasing rainbows and crossing rivers. Think, for example, of the delightfully earnest Betty Anderson (portrayed fetchingly by Elinor Donahue) on the old 1950s-60s sitcom Father Knows Best. Think Betty's going to do this kind of thing? Yet her granddaughters well may be pursuing exactly such a course. As I write this, two of the young women who were my high school students and who are now in their middle twenties are off on their own "Miss Mary" excursions. One has been crossing oceans in a sailboat and has wound up in places as diverse as Gibraltar and Brazil. Another has lived on three continents and for the last several months has been motoring around Europe completely on her own, crossing a somewhat dangerous border into Serbia just this morning. I'm pretty sure that neither women's places in the world nor the future of society occurred to John Stewart and John Phillips when they wrote "Oh Miss Mary" - it was just an enjoyable little tune to play on guitar and banjo. But without intending to do so, they may just have penned a song whose time has finally come. I'm wondering where my own young "Miss Marys" will be off to next.